Nine members of Tokyo Bar Association and Mr. Tsuda Daisuke, a journalist, with a group of 20 students from Waseda University visited us in front of the Gate. Having observed the riot police forcibly removing the citizens and the Defense Bureau making the deliveries as it wishes, what, I wonder, have the students felt? They earnestly listened to the protestors. 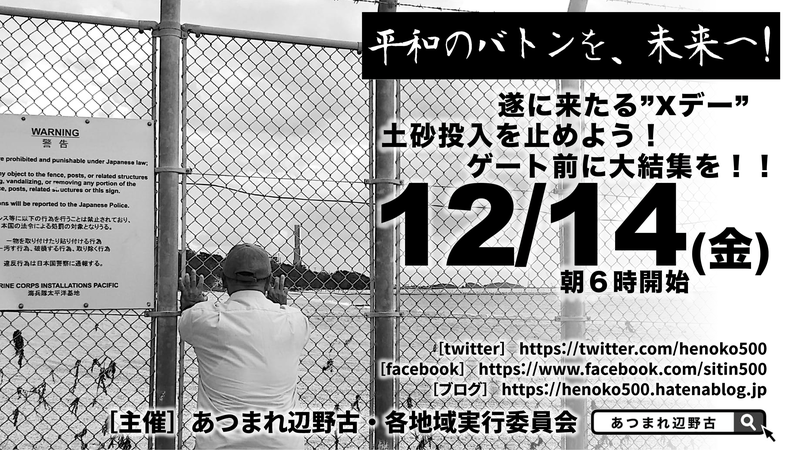 I hope that they would get the gut feeling on the abnormal situation of Okinawa and convey it to the fellow youth. One of the students said, “Dumping in front of my eyes made me understood the complexity of the problems that Okinawa faces”. 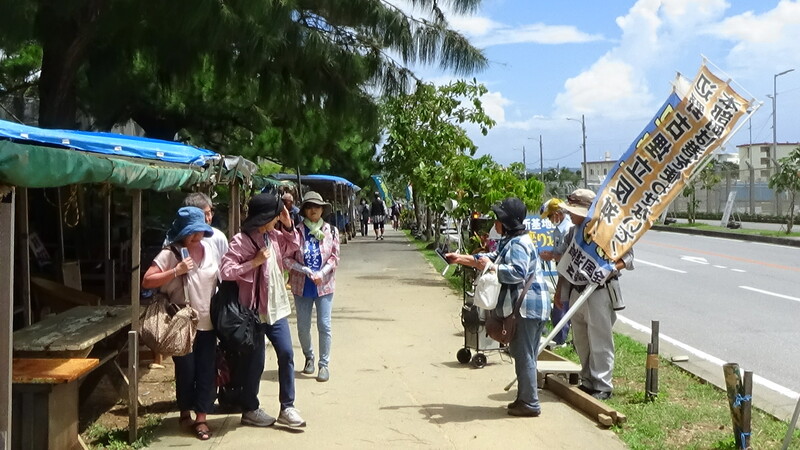 A protest action was also made in Takae today and effectively reduced the number of deliveries down to 19 truckloads. In the morning, approximately 20 fully loaded trucks came to the Pier, but returned without unloading dirt and sand. The carrier boats did not come close to the pier, and no loading was made. Probably, they decided that high waves were too dangerous for a boat to fasten to a quay. Prime Minister Abe, answering a question in the Diet, admitted for the first time that there is a soft ground in the seabed of the Ohura Bay, and that a large scale reinforcement work is required before the construction of the military base. The soft ground is “as soft as mayonnaise” and reaches to the depth of 40m. The reinforcement work requires 60,000 sand pillars buried into the depth of 70m. Any change to the construction plan requires an approval by the Governor of Okinawa, but the Governor Tamaki already made it clear that he would not approve the change. 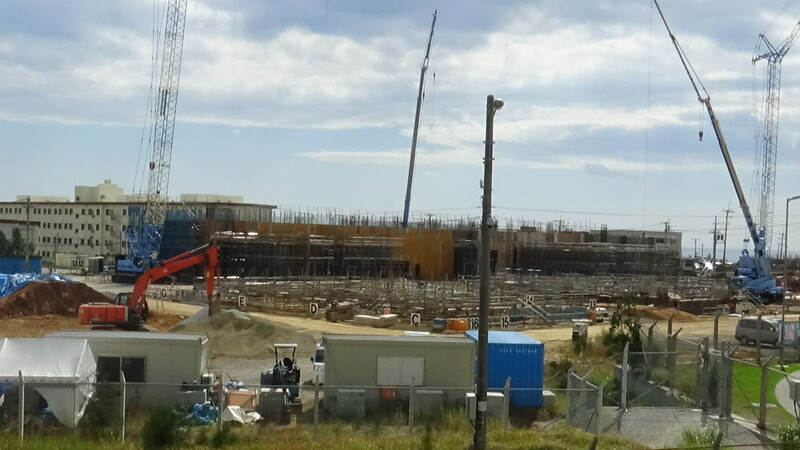 The Prefectural government estimated that the reinforcement work would take 13 years and cost 10 times more than the initial budget. Destroying the Ohura Bay, a precious nature of the world, the Administration plans to spend a horrendous amount of money to build a US military base. This is the worst and the most ridiculous action that makes a fool of Okinawan.